It is my firmly held belief that when one is living in a foreign country, one should aim to fully embrace the local customs and culture. This belief can be loosely adapted to mean, eat what the locals eat, and eat as much of it as possible, as often as possible. That, my friends, is why I downed Rioja and queso manchego (and churros y chocolate, and tinto de verano, and tortilla…you get the idea) whenever possible in Spain. It is also what led me to embark on the culinary journey that I’m sharing with you today, my first foray into Kiwi baking: hot cross buns for Easter. It turns out that “Hot Cross Buns” is not just the name of the first song you learn to play on the recorder in 4th grade, they’re actually a real baked good, and they’re kind of a huge deal down here during Easter. About a week ago I started to notice them popping up everywhere; in the supermarket, in radio ads, in the kitchen at the café where I work, and because Good Friday is a public holiday here I resolved to use the day to bake my first batch of hot cross buns. Now, for some, this undertaking would be (pardon my baking pun) a piece of cake, requiring no more than a few hours in the kitchen. However, my baking prowess does not extend beyond making a mean batch of monster cookies, an expertise that I honed in college for the purpose of living off of them almost exclusively during finals week. 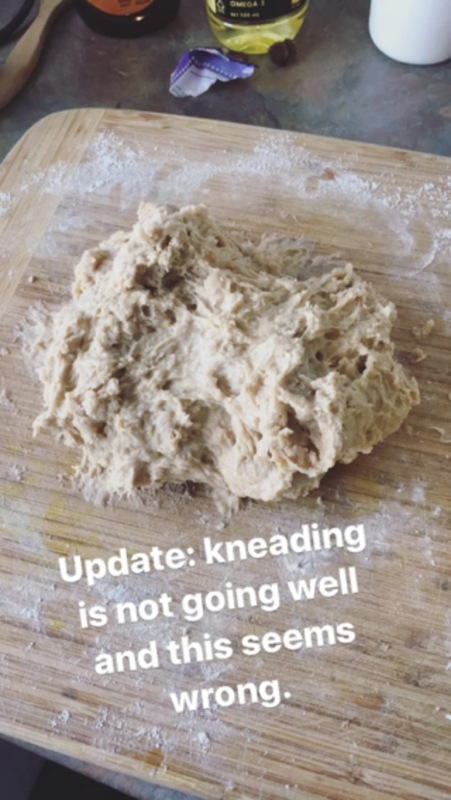 Given my shoddy track record and notorious clumsiness when it comes to cooking or baking, I knew this baking experiment would require the entirety of my day. So after work on Thursday, armed with Mary Berry’s classic recipe, I ventured out into the torrential rain (courtesy of Tropical Cyclone Cook) and made my way to the supermarket to pick up the essential ingredients. Any vestiges of confidence soon faded as a stood motionless in the baking aisle, staring blankly at the shelves of flour wondering which variety would qualify as “strong white flour” that was called for in the recipe. Then the voice of God snapped me out of my confused trance, “Hello shoppers, the store will be closing in fifteen minutes, thank you for choosing Countdown.” I snatched the generic brand of “high quality” flour and threw the remaining unfamiliar ingredients into my cart (Golden Syrup? Mixed Spice? These things sounded made up.) Bagful of groceries in hand, I crossed the parking lot and knew there was no going back now; I was making these suckers. My supermarket haul, ready to be assembled into some hot cross goodness. 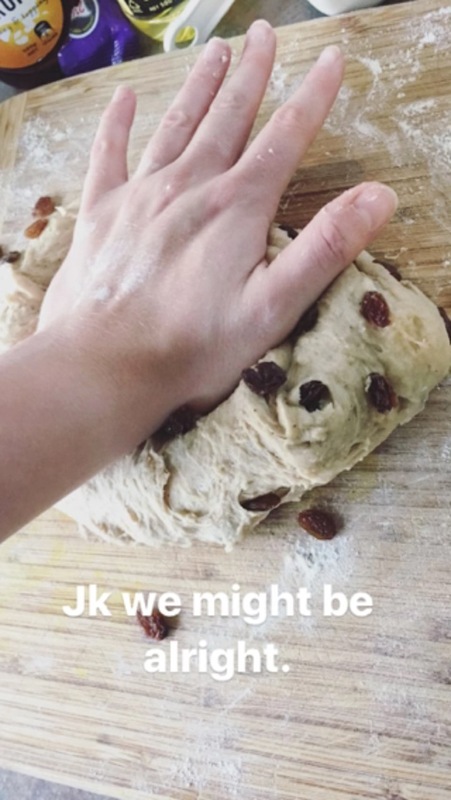 When it came time to knead, the dough was a lot stickier than it seemed it should have been, it barely rose at all, and my flour paste to make the traditional crosses on top of the buns was so runny I had to catch it with my hands so it didn’t spill all over the tray. However, I ended up with a pretty decent final product, all things considered. Yes, they were definitely on the dense side, but they tasted pretty darn good, and they sure were prettier than I had envisioned my first try would come out looking. So folks, here’s to trying things you’re notoriously bad at in the name of cultural enrichment. Happy Easter! *I realize "culinarily" is not a real word, but this is a travel blog not an English classroom, right?